Of the various vulnerabilities traditional financial assets are exposed to, a rising oil price is of particular concern. In 2004, oil hit an all-time high of $56 per barrel, up 366 percent from the $12 low of 1998, and up 75 percent since January 2004. Generally speaking, an increasing oil price results in increasing inflation, negatively impacting the global economy, particularly oil-dependent economies such as the US. Apart from increased transportation, heating and utility costs, higher oil prices are eventually reflected in virtually every finished product, as well as food and commodities in general. Furthermore, there is evidence that global oil production is peaking and the flow will soon be in permanent decline. The US has enjoyed inexpensive oil-based energy for nearly a century, and this is one of the prime factors behind the unprecedented prosperity of its economy in the 20th century. While the US accounts for only 5 percent of the world's population, it consumes 25 percent of the world's fossil fuel-based energy. It imports about 75 percent of its oil, but owns only 2 percent of world reserves. Because of this dependency on both oil and foreign suppliers, any increases in price or supply disruptions will negatively impact the US economy to a greater degree than any other nation. The majority of oil reserves are located in politically unstable regions, with tensions in the Middle East, Venezuela and Nigeria likely to intensify rather than to abate. Because of frequent terrorist attacks, Iraqi oil production is subject to disruption, while the risk of political problems in Saudi Arabia grows. 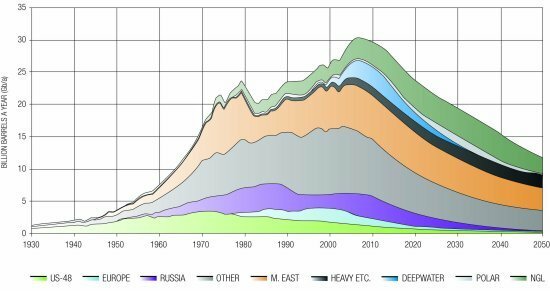 The timing for these risks is uncertain and hard to quantify, but the implications of Peak Oil are predictable and quantifiable, and the effects will be more far-reaching than simply a rising oil price. In the early 1950s, M. King Hubbert, one of the leading geophysicists of the time, developed a predictive model showing that all oil reserves follow a pattern called Hubbert's Curve, which runs from discovery through to depletion. In any given oil field, as more wells are drilled and as newer and better technology is installed, production initially increases. Eventually, however, regardless of new wells and new technology, a peak output is reached. After this peak is reached, oil production not only begins to decline, but also becomes less cost effective. In fact, at some point in this decline, the energy it takes to extract, transport and refine a barrel of oil exceeds the energy contained in that barrel of oil. When that point is reached, extraction of oil is no longer feasible and the reserve is abandoned. In the early years of the 20th century, in the largest oil fields, it was possible to recover 50 barrels of oil for each barrel used in the extraction, transportation and refining process. Today that 50-to-1 ratio has declined to 5-to-1 or less. And it continues to decline. Hubbert's 1956 prediction that crude oil production in the US would peak in the early 1970s and then decline was greeted with great skepticism. After all, production in the US was increasing and technology was improving. However, there were no new major reserves being discovered, and his prediction proved to be correct. Oil production in the US did peak in 1970, and has been declining ever since. Using analytic techniques based on Hubbert's work, oil and gas experts now project that world oil production will peak sometime in the latter half of this decade. We are now depleting global reserves at an annual rate of 6 percent, while demand is growing at an annual rate of 2 percent (and that growth rate is expected to triple over the next 20 years). This means we must increase world reserves by 8 percent per annum simply to maintain the status quo, and we are nowhere near achieving that goal. In fact, we are so far from it that, according to Dr. Colin Campbell, one of the world's leading geologists, the world consumes four barrels of oil for every one it discovers. Once a supply shortfall materializes, the US will be in competition with China, India, Japan and other importing countries for available oil. Many experts are now predicting US$100 per barrel within the next two years. Some believe it will go even higher. Taking geopolitical factors and supply/demand fundamentals into consideration, it is impossible to predict how high the price of oil will soar. One thing seems certain - the age of cheap oil is over. There are numerous social, economic and political implications related to world oil production peaking in the next few years, but our concern here is to examine how a rising oil price is linked to precious metals. The answer to that question begins with the historical desire of Arab producers to receive gold in exchange for their oil. This dates back to 1933 when King Ibn Saud demanded payment in gold for the original oil concession in Saudi Arabia. In addition, Islamic law forbids the use of a promise of payment, such as the US dollar, as a medium of exchange. There is growing dissention among religious fundamentalists in Saudi Arabia regarding the exchange of oil for US dollars. Oil, gold and commodities have all been priced in US dollars since 1975 when OPEC officially agreed to sell its oil exclusively for US dollars. From 1944 until 1971, US dollars were convertible into gold by central banks in order to adjust for any trade imbalances between countries. Up to that point, the price of gold was fixed at US$35 per ounce, and the price of oil was relatively stable at about US$3.00 per barrel. Once the US ceased gold convertibility in 1971, OPEC producers were forced to convert their excess US dollars by purchasing gold in the marketplace. This resulted in price increases for both oil and gold, until eventually oil reached US$40 per barrel and gold reached US$850 per ounce. Today, apart from geopolitical threats in oil-producing regions, supply/demand imbalances from Peak Oil and increasing demand from developing countries, the price of both gold and oil can be expected to increase as the US dollar declines. With an ever-increasing US money supply, growing triple deficits and mounting debt at all levels, the US dollar is likely to continue the decline that began in 2001. Since then, foreign holders of US dollar assets have already lost 33 percent of their investment. How long will oil exporters continue to accept declining US dollars? How long will they continue to hold US dollars as their reserve currency? At some point, they may decide to abandon the US dollar in favour of euros. Russian premier Vladimir Putin and Venezuela's president Hugo Chavez have both publicly announced that they may begin to price oil in euros in the near future. Even Saudi Arabia has stated that it is considering pricing its oil in euros, as well as in US dollars. There have even been discussions among Arab nations about pricing oil in Islamic gold and silver dinars. If this happens, other producers may follow suit and opt out of accepting US dollars for oil. Demand for the currency will plummet, sending the dollar into a freefall while demand for euros, gold and silver soars. In addition, Middle Eastern oil producers would be forced to diversify their vast US dollar holdings into precious metals and other currencies to protect themselves from further losses. As losses mount, other large, non-oil producing, US dollar holders such as Japan, China, Korea, India and Taiwan would seek to diversify out of US dollars. Eventually, this could result in a dollar sell-off and a corresponding increase in oil and gold prices. Over the last 50 years or so, gold and oil have generally moved together in terms of price, with a positive price correlation of over 80 percent. During this time, the price of oil in gold ounces has averaged about 15 barrels per ounce. However, with recent soaring oil prices, the relationship has strayed far from this average. While oil prices recently set an all-time high of $56 per barrel, gold prices have not kept pace and the oil:gold ratio fell to an all-time low of 7.5:1. At US$56 per barrel oil, the gold price should be in excess of US$840 per ounce. Some experts are suggesting that, in two or three years, US$100 per barrel oil is very possible. At that price gold should be US$1500 per ounce. The gold silver:ratio has varied from 16:1 to 100:1. Currently it is about 66:1. Gold Fields Mineral Services expects this ratio to fall to between 40:1 and 50:1 in the near future. At a 50:1 ratio and a $1,500 gold price the price of silver should be $30/ounce. At 16:1 it would be $94/ounce. The size disparity between oil and gold markets must also be considered. While annual gold production is approximately US$35 billion, annual oil production is US$1.5 trillion, by far the largest-trading world commodity. As oil prices increase and demand for US dollar diversification increases, there will be an ever-expanding number of petro dollars and other offshore dollar holders chasing a relatively small amount of bullion ounces. In conclusion, the price of oil is poised to rise steadily as the supply/demand imbalance increases and the dollar declines, even if there are no supply disruptions, terrorist threats or geopolitical concerns to consider. As this happens, the price of precious metals will climb until they eventually catch up to their historic ratios. Should oil producers demand euros, dinars or precious metals in payment for their product, the decline in the US dollar will accelerate while the price of precious metals explodes. If oil producers and other foreign US dollar holders begin to sell the trillions they hold and diversify into alternatives, then the price of both oil and precious metals will rise to levels that today are hard to imagine. The opinions, estimates and projections ("information") contained herein are solely those of Bullion Management Services Inc (BMS) and are subject to change without notice. BMS is the investment manager of The Millennium BullionFund (MBF). BMS makes every effort to ensure that the information has been derived from sources believed to be reliable and accurate. However, BMS assumes no responsibility for any losses or damages, whether direct or indirect which arise out of the use of this information. BMS is not under any obligation to update or keep current the information contained herein. The information should not be regarded by recipients as a substitute for the exercise of their own judgment. Commissions, trailing commissions management fees and expenses all may be associated with an investment in MBF. Please read the prospectus before investing. MBF is not guaranteed, its unit value fluctuates and past performance may not be repeated. Nick Barisheff is the founder, president and CEO of Bullion Management Group Inc., a company dedicated to providing investors with a secure, cost-effective, transparent way to purchase and hold physical bullion. BMG is an Associate Member of the London Bullion Market Association (LBMA). His website is www.bmgbullion.com.